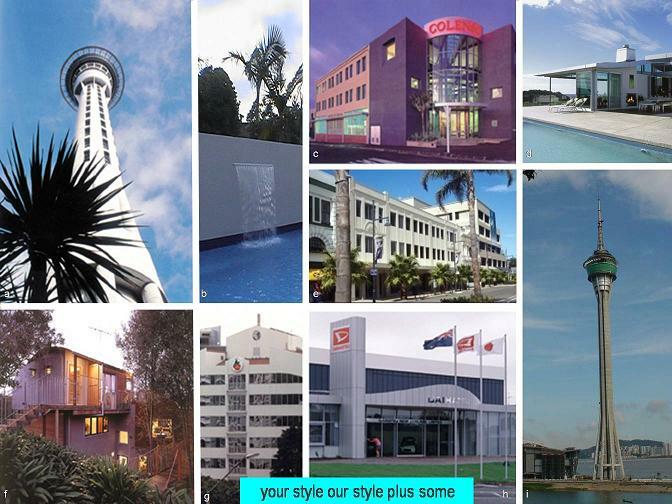 a - Sky Tower, Auckland, NZ, Director was the Project Architect for CCM, b - Pool & Waterfall, Auckland, NZ, Architects-ldl , c - Colenso House, Ponsonby, NZ, Director was the Project Architect for John Porter Architect, d - Coastal Home, Auckland, NZ, Architects-ldl, e - Emerald Hotel Gisborne, Architects-ldl with Hornby Architects, f - Directors own house, Remuera NZ, g - NZ Apple & Pear Board, Wellington, NZ when Director was an Architectural Technician with Structon Group, h - Daihatsu Showroom, Auckland, NZ, when Director was an Architect for Architect Co-ordinates, i - Macau Tower, China, Director was the Project Architect for CCM. Our collaborative architects creative design services are in three straightforward stress free stages to minimize your risk and to help you make decisions: design; documentation and construction. In the Design Stage we thoroughly establish your design requirements and undertake an in-depth on-site investigation of your property. We find all the critical information about your property and through specific consultation with our Local Authority and Construction Industry contacts we get you the right facts first. This stage is when the creativity, architecture and bright ideas happen and through our design exploration techniques, the best possible Concept Design solution is discovered. With your valuable input the exciting Concept Design that emerges is developed in ready for the construction documentation. Our practical knowledge of the regulations and construction are applied in the Documentation Stage where we prepare accurate detail working drawings, descriptive specifications, right down to selecting the materials and finishes, so that the Builder can easily build your project, and so it will comply. We attend to the paperwork for any Resource and Building Consents Applications. When required we have a great team of Consultants and Specialists that are readily available to provide high-quality technical advice for your project. To put your mind at ease the all important construction contract, budget and program are established by our rigorous Tender Negotiation process before starting the construction. This is another decision laden stage, but you can relax. Working closely with you and the Builder we skillfully manage your project during the Construction Stage. We provide advice about construction matters, resolve tricky building and compliance issues, hold regular site meetings, review shop drawings, review samples, and consider any submissions to use alternative materials, frequently inspect the work quality, monitor and process building costs. Our quality control procedures ensure that all building defects are rectified, that you will get written warrantees for the work and that a Local Authority Code Compliance Certificate is issued for the finished project. Click HERE for more information about Architects ldl. The contract with them on this project provided the benefits of experienced and innovative design expertise together with skilled professional management throughout the building and completion stages. They remained consultative during the whole process, listening carefully to my ideas and requirements, including my input at every stage. The overall result has been extremely successful. I have achieved everything that I wanted in a comfortable, gracious house.